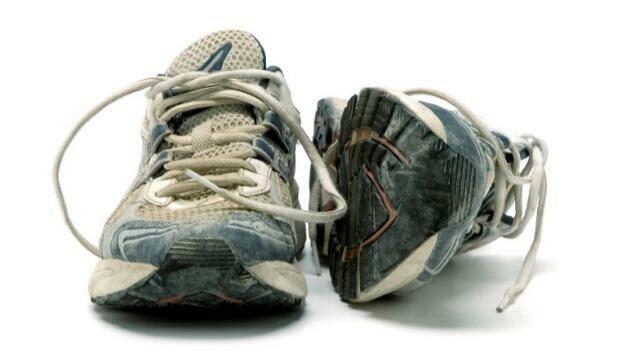 Any number of factors can make your running shoes wear out faster. Even though the bottom of the shoes may appear to have plenty of tread, the mid-sole material can still be broken down. So how do you know when it's time to chuck out the old and replace your running shoes? If you viewed the mid-sole material under a microscope, you would see hundreds of tiny air pockets that look a lot like a sponge. This material is a polymer called EVA, or Ethylene Vinyl Acetate. When the foot strikes this material, the tiny air pockets collapse just like a sponge reacts when it's squeezed. This action provides your foot with shock absorption. A runner's weight: The heavier the runner, the more likely the cushioning part of the shoe located at the mid-sole is going to break down. Lack of rotation: Your shoes might last longer if you're rotating them with other pairs. The tiny air pockets within the EVA have more time to recover or bounce back from being compressed when they are rotated. Studies have shown that rotating two pairs of shoes will help them last about the same amount of time as three pairs that are not rotated. By wearing a different pair of shoes every other day, you can get a 50 percent improvement on the wear of that mid-sole section.